A numerical tool was developed to calculate the stormwater runoff total suspended solids (TSS) removal efficiency of bioretention cells to assist engineers in obtaining credit and approval for bioretention cell facilities. Numerical models for filtration were used in developing this tool, as they have previously been successfully used for bioretention cells. The equations were adapted to integrate with the widely used USEPA SWMM, through its Add-in Tools feature. The tool was first tested to ensure the model matched the monitored performance of a bioretention cell and, second, benchmarked against the TSS removal predicted by another modeling tool (WinSLAMM). The capability of the tool to accurately simulate the TSS reduction performance of the monitored bioretention cell supports its suitability for use in designing bioretention facilities. This research, model development, and verification are the first steps towards the complete development of a stormwater runoff TSS removal model capable of continuous simulation, which will aid in bioretention cell design and installation. Bioretention cells have in recent years become one of the more popular low impact development (LID) technologies in both new land developments and retrofit applications (Credit Valley Conservation–Toronto and Region Conservation 2010). Currently, there is not a tool that is readily available to engineers and designers for determining the total suspended solids (TSS) removal efficiency of a bioretention cell. The lack of such a calculation in design reports can lead to difficulties in receiving credit or approval from the reviewing authorities for an appropriately designed bioretention facility. Recognizing that the stormwater runoff quality treatment capacity of a bioretention cell varies from site to site, the objective of this study is to develop and test a tool that incorporates each unique site’s characteristics as well as the design of the bioretention cell itself into the calculation of the treatment efficiency, using readily available and often used hydrologic models. Prior to developing the tool, we selected 19 currently available stormwater software applications to analyse in order to determine their capabilities. A meta-analysis of modeling software reviews was also completed (Elliott and Trowsdale 2007; Jayasooriya and Ng 2014). Each application had to meet the following criteria: to be capable of being used as a site level design tool that determines the TSS removal of alternative bioretention cell designs; and to be applicable to climate and soil conditions in Ontario. Table 1 shows the applications that were reviewed. Table 1 Stormwater software applications analysed for this study. The only software tool that completely met the chosen criteria was WinSLAMM. USEPA SWMM does not have the ability to model TSS reduction through a bioretention cell; however, because it is open source and can incorporate post-processing tools via its Add-in Tools feature, it was considered. WinSLAMM is a modeling tool which focuses on small storm hydrology and particle washoff. WinSLAMM’s methods are based upon field observations, with as little use as possible of purely theoretical processes (PV & Associates 2013). WinSLAMM models bioretention cells (called biofilters) as multi-featured control devices and includes routing calculations for pond storage together with a variety of outlet and treatment methods. These outlet devices can include native soil infiltration, evaporation, surface discharge through overflows, subsurface discharge through underdrains, or a controlled structure with regulated withdrawals (PV & Associates 2014). To estimate pollutant removal, WinSLAMM uses the rate of flow entering the device, the infiltration rate into native soil, the filtering capacity of the engineering fill, the amount of storage in the rock layer, and the size of the device and other outlet structures. The end state of the runoff is a key factor used to determine the amount of treatment it will receive, as runoff that goes through an overflow device receives no treatment, whereas runoff that is infiltrated into the native soil receives 100% treatment and runoff that goes through the underdrain receives treatment by the engineered fill. WinSLAMM’s engineered fill treatment of TSS is determined by the blend of engineering fill and TSS particle sizes. Table 2 shows the removal percentage of each TSS particle size by a specific fill type. USEPA’s Stormwater Management Model (SWMM) was created in order to facilitate the planning, analysis and design of stormwater control practices. SWMM simulates runoff production over catchments and routing across catchments through low impact development (LID) features and through conveyance systems. SWMM can be used both for a single design storm event and for long term continuous simulations. SWMM tracks the quantity and quality of the stormwater runoff. However, while some nodes (storage) can perform runoff quality treatment, the LID module currently does not offer runoff quality treatment simulation. The LID module can simulate the hydraulics associated with the following LID technologies: permeable pavement, rain gardens, green roofs, street planters, rain barrels, infiltration trenches, and vegetative swales (Rosman 2015). There are two approaches a user may take to place any LID control into a subcatchment: placing the LID control into an existing subcatchment and so occupying a portion of it; or creating an entirely new subcatchment and sizing it so that the LID control occupies the entire subcatchment. In the first method, the user can add multiple LID controls and each will treat a portion of the subcatchment’s runoff, acting in parallel; in the second method LID controls can be chained together creating runoff treatment in series (Rossman 2015). The current tool was created after a review of many studies of TSS filtration. In order for particles that are suspended in a solution to be removed, they must come into contact with the grains of a filter medium, or collector. The transport of these suspended particles to the collector is referred to as a transport mechanism. There are three important transport mechanisms: interception, sedimentation and diffusion. The three mechanisms are shown in Figure 1. Figure 1 Suspended particle transport mechanisms (Yao et al. 1971). Interception occurs when the size of the suspended particle is such that it comes into contact with the collector. Sedimentation occurs when the density of the suspended particle differs from the density of the fluid and the imbalance betweenbuoyancy and gravitational forces cause the particle to deviate from the streamflow and come into contact with the collector. Diffusion occurs when the suspended particle is bombarded with solution molecules thus causing Brownian motion (Yao et al. 1971). dc = collector diameter, cm. v0 = velocity of fluid, cm/s. nG = sedimentation transport mechanism. Equation 1 represents the performance of a packed filter bed and is related to the efficiency of a single spherical collector. Equation 2 represents the clean single collector efficiency. Equation 3, Equation 4 and Equation 5 each represent a specific transport mechanism: diffusion, interception and sedimentation respectively (Yao et al. 1971). Since the work by Yao et al. there have been developments to the single collector model. For example, O’Melia and Ali considered the case where the captured particles improve the removal properties of the filter media by behaving as additional collectors (O’Melia and Ali 1979). These enhancements were validated and tested for their predictive properties to determine ranges for the additional model parameters (Tobiason and O’Melia 1982). Bioretention cell design is often finalised through the use of a design storm. It is because of this use of a limited duration event that the original filtration model was selected for inclusion in the tool. The enhancements described above cause the state of the filter to change over time and modeling this change is only required for long term continuous simulation. The original filtration model has previously been used for bioretention cells (Li and Davis 2008; Liu and Davis 2014) where it was found to provide adequate results despite its underlying assumptions, which were: steady state conditions; single suspended particle size; single filter media grain size; and retained particles do not change filter properties. The tool we developed is an event-based bioretention cell model which uses the Yao et al. filtration equations to simulate the cell’s TSS removal mechanisms. The current software was created to work with SWMM as an add-in tool. SWMM add-in tools are third-party applications that can be launched by SWMM. These add-in tools can be configured in the Tools menu and can be developed to perform any user-required post-processing of data. There are several parameters that can be configured by the user and generally these must match the specifications required by the user. Use of the tool requires that the user create and run a simulation of their site and bioretention cell and generate the LID detailed report. The LID detailed report is an output option in SWMM which contains details of the hydraulic activity in the LID (Table 3). The current tool includes a Basic mode, which does not require the LID detailed report; however, the analysis of the hydraulic details in the Advanced mode offers a more realistic simulation. Table 3 EPA SWMM LID detailed report example. In the Advanced mode, during each time step the runoff receives 0% treatment (overflow), 100% treatment (native soil infiltration), or partial treatment (through the filter media and out through the underdrain). The tool uses the hydraulic calculations completed in SWMM only to simulate the treatment of the underdrain flow. The Advanced mode tracks each possible runoff endpoint and determines the TSS performance of the bioretention cell through this more complex analysis of the runoff flows. The simulation was run iteratively, passing each TSS particle size through the filter separately, but it was found that when considering only the reduction in TSS, the total removal was the same as that calculated when using a single weighted average for the particle size. It is for this reason that the simulation used a single TSS particle size, calculated as a weighted average from the particle size distribution. To validate the current tool for use in Ontario the model needed to be tested using local data. The Toronto and Region Conservation Authority (TRCA), as a part of its Sustainable Technology Evaluation Program (STEP), supplied the data from one of their monitoring sites at the Kortright Centre parking lot. TRCA had monitored the runoff from a rubber–asphalt parking lot, which was adjacent to a traditionally surfaced parking lot that drained to an infiltration trench and a bioretention cell, both of which were also monitored. Figures 2 and 3 show the site layout and the bioretention cell details (STEP 2015). We tested the current tool using only the bioretention data, which consisted of data for the rainfall, inflow and outflow monitored during the period 2013-04 to 2014-11. Over the monitoring period, there were 8 water quality events that were used to calibrate and validate the TSS model. The rubber–asphalt parking lot runoff data was adapted and scaled for surface area, to be used as the inflow to the bioretention cell. The bioretention cell received the runoff from a 297.5 m2 parking lot constructed of impervious rubber–asphalt pavers, and had an infiltration footprint of 30 m2. The runoff from the parking lot was channelled through an inlet 2 m2 in area and 0.2 m deep that was constructed of large river stones on top of a Terrafix 270R geotextile before entering the bioretention cell (STEP 2015). The inlet channel geotextile was laid over a graded concrete pad to ensure that all of the runoff flowed into the bioretention cell. The bioretention cell consisted of a 75 mm deep layer of hardwood mulch on top of a 600 mm deep filter media layer. The filter media layer comprised 60% sand and 40% silt and clay, and was 5% organic matter by dry weight. Under the filter media there was a stone reservoir, consisting of a 339 mm deep layer of 20 mm clear gravel and including a perforated pipe (100 mm in diameter), which was laid 139 mm above the bottom of the cell. The bioretention cell had an overflow structure consisting of a standpipe with a perforated cap, which drained into the underdrain–outlet structure. From the as-built diagram of the site, the height of the overflow cap above the invert of the underdrain was 1202 mm, which means it extends 327 mm above the media. Since the flow was monitored at the outlet structure, the monitored volume may have been a mix of both overflow and underdrain flows. Through a review of a geotechnical report for the site, as well as of the as-built drawings of the Kortright Centre, we determined that the native soil was clay silt till. The consistency of the till was 2% gravel, 26% sand, 56% silt and16% clay, which is also referred to as silty loam (Terraprobe Limited 2008). The silty loam classification of the soil was used to determine Green–Ampt values for the model. Conductivity of 6.6 mm/h (K), suction head of 169.9 mm (ψ), porosity of 0.501 (n), field capacity of 0.284, and wilting point of 0.135 were selected (Rossman 2015). The first step in the calibration of the TSS model was to calibrate the SWMM model’s hydrology. The model was continuously run from 2013-05-01 to 2013-09-30. The details of the four 2013 water quality events were used for calibration. The SWMM model was designed with two subcatchments, where the larger catchment (297.5 m2) represented the 100% impervious parking surface with its runoff routed to the smaller (30 m2) catchment that represented the bioretention cell. The outflow generated by the SWMM model’s parking lot subcatchment (the bioretention cell inflow) is shown in comparison with the monitored bioretention cell inflow values in Figure 4. Figure 4 Calibration: SWMM model runoff vs control runoff. After calibrating the inflow runoff to the monitored water quality events, the next step was to calibrate the bioretention cell parameters until the modeled volume that left the system closely matched the monitored outflow volumes. For the four events the monitored volume represented all of the stormwater flow leaving the bioretention cell, both overflow and underdrain flows. These values are shown in Table 4, with an average error of 11.9%. Table 4 Calibration: SWMM model and monitored combined outflows. The SWMM model was run for each individual water quali-ty event whereas the previous two calibrations were analyses of event totals from continuous TSS simulation. There are therefore some differences between the inflow and outflow volumes. For TSS particle size distribution the TRCA’s PSD was selected (Clarifica Inc. 2003): 20 µm (20% of mass), 30 µm (10%), 50 µm (10%), 95µm (20%), 265 µm (20%), and 2200 µm (20%). The TRCA recommended values were also used for the filter media blend specifications (Credit Valley Conservation–Toronto and Region Conservation 2010): 85% sand and 15% fines (dc = 872 µm). This range of suspended particles consists of particles that are larger than the range tested by Yao et al. during the initial model development (10−2µm to 102 µm for their numerical analysis and of 0.091 µm to 25.7 µm for experimental analysis; Yao et al. 1971). While they found that settling and interception were the primary transport mechanisms for particles >1 µm diameter, this observation was not re-analysed because the composite removal efficiency was of primary interest and only composite samples were collected during the case study. Table 5 contains the monitored hydraulic and water quality details of the four 2013 water quality events, while Table 6 shows the values that were produced by the event simulations and application of the model. Due to the variations in runoff volumes and TSS values, the reduction values were compared. Table 5 Calibration: monitored TSS reduction. Storm Event Date Runoff Vol. Table 6 Calibration: modeled TSS reduction. Table 7 shows the difference between the runoff reduction and the TSS reduction errors for the monitored values and the modeled values. The larger error (runoff reduction) may be because of an inability to calibrate the hydrology of the site any closer to the monitored data, particularly the parking lot to rubber–asphalt volumes (bioretention cell inflow). However, the error in TSS reduction is very small. Table 7 Calibration: modeled vs monitored reduction comparison. Following calibration, the model was validated with the four 2014 events to compare the model’s performance on unseen data. Validation followed the same four steps as the calibration, comparing each of the same parameters as calibration. 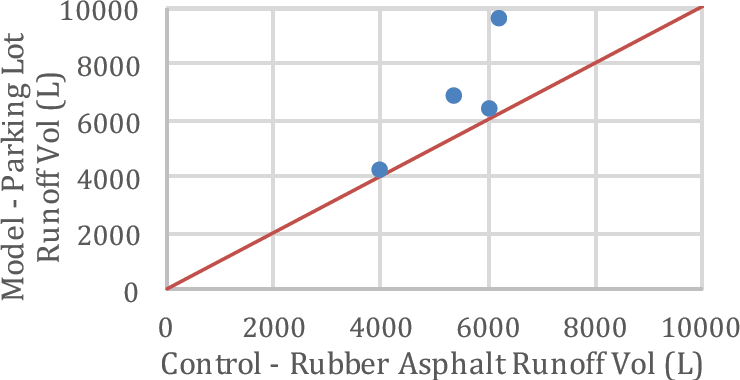 Figure 5 shows the monitored rubber–asphalt parking lot runoff compared to the SWMM modeled parking lot runoff. Table 8 shows the monitored outflow from the bioretention cell compared to the outflow calculated by the SWMM model. 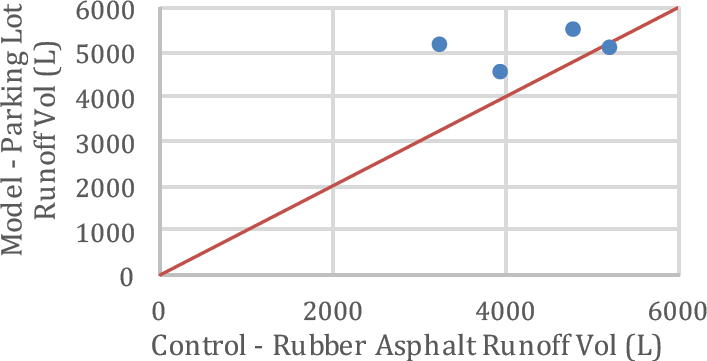 Figure 5 Validation: SWMM model runoff vs control runoff. 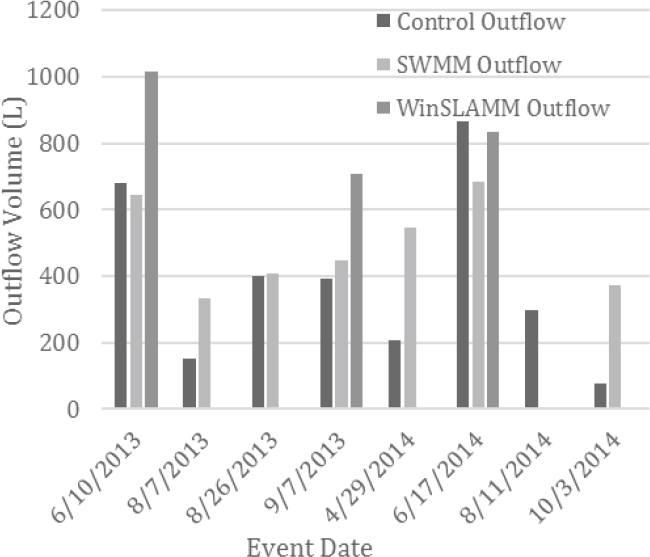 Table 8 Validation: SWMM model and monitored combined outflows. Tables 9, 10 and 11 compare the monitored runoff and TSS reductions, the modeled runoff and TSS reductions, and the differences between the reductions respectively. As expected the validation model values do not fit as well as the calibration values, but are still within a fair range of error for the runoff reduction and a good range of error for the TSS reduction. Table 9 Validation: monitored TSS reduction. Table 10 Validation: modeled TSS reduction. Table 11 Validation: modeled vs monitored reduction comparison. The WinSLAMM model was created with the same case study site details that were used to create the SWMM model described above. In WinSLAMM the model was created by adding a catchment having a specific land use. A commercial land use was selected, with an area the size of the parking lot that drained to the bioretention cell. For each area classification, the user has the option of specifying a treatment method and for the Kortright Centre parking lot site a bioretention cell was specified (it is called a biofilter in WinSLAMM). The biofilter is specified as the first control device for the parking area. After running the simulation, the output summary from WinSLAMM was used to determine the amount of stormwater treated by the biofilter, the amount of runoff leaving the biofilter, and its TSS treatment level. The details in the summary allowed for the WinSLAMM model output to be compared to those values generated by the SWMM integrated TSS model. The WinSLAMM model was not further calibrated over the 2013 and 2014 events. The two models were compared for each of the eight water quality events using the monitored data for inflow volumes, outflow volumes, runoff reduction and TSS reduction. 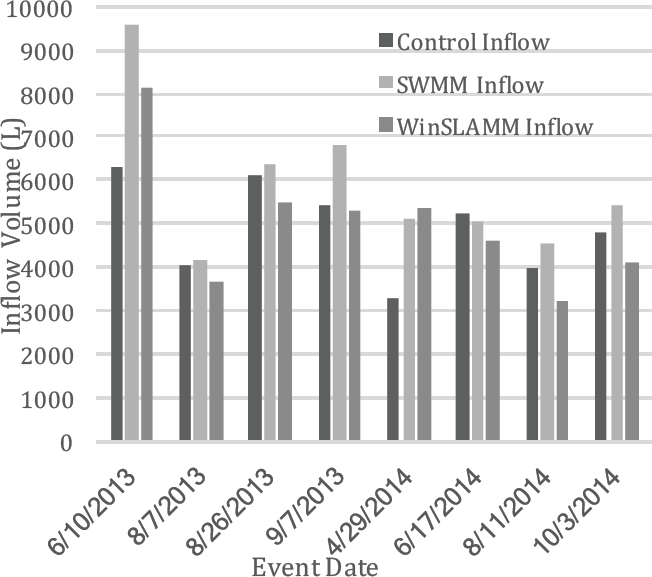 Figure 6 shows the inflow values for the selected events for the control surface, the SWMM model and the WinSLAMM model. Figure 7 shows the outflow volumes for the events. The average errors for inflow were 21.6% in SWMM and 20.1% in WinSLAMM. For outflow the average errors were 102.3% in SWMM and 79.2% in WinSLAMM. The WinSLAMM error appears to be better because for five of the eight events the model produced 0 L runoff, which resulted in a 100% error, while on three occasions the SWMM model over-predicted runoff which resulted in >100% error (e.g. for the 2014-10-31 event: control 75 L, SWMM model 374 L, WinSLAMM model 0 L; SWMM error 398.67%, WinSLAMM error 100%). Figure 6 Benchmark: inflow volume comparison. Figure 7 Benchmark: outflow volume comparison. Figure 8 Benchmark: runoff volume reduction comparison. Figure 9 Benchmark: TSS reduction comparison. Figure 8 above shows the runoff volume reduction for both the calibration and the validation events. Figure 9 above shows the TSS reduction results obtained for the monitored site and the two models. 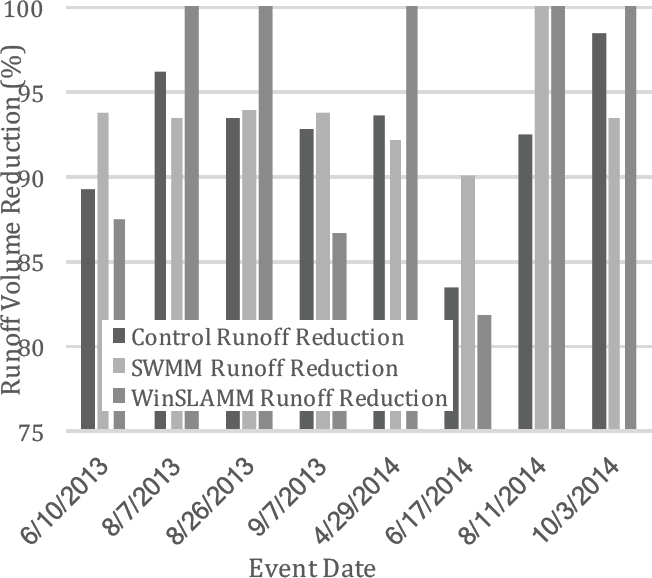 The SWMM model reproduced the runoff reduction with an average error of 4.0%, while the WinSLAMM model had an average error of 4.8%. 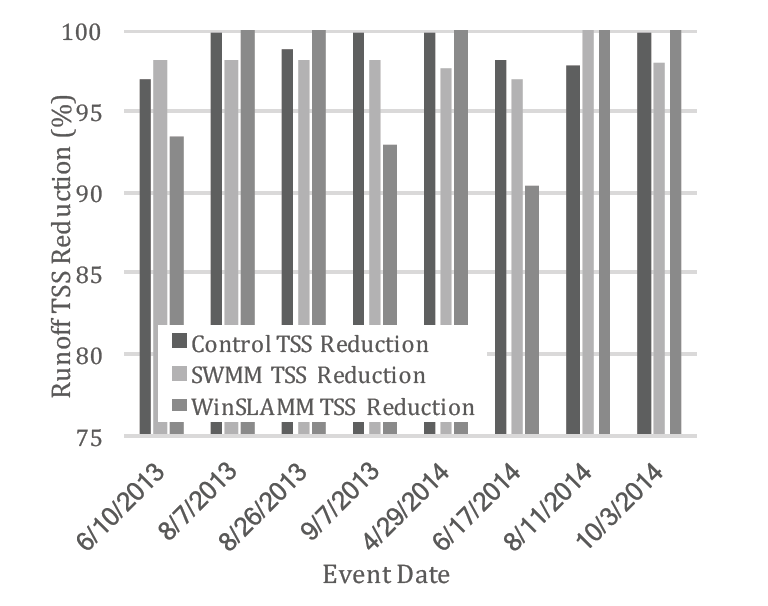 The SWMM + TSS model reproduced the TSS reduction monitored with a 1.6% average error, while WinSLAMM had an average error value of 2.8%. A model for calculating the TSS reduction in a bioretention cell was developed using the USEPA SWMM Add-in Tools feature. The TSS model was calibrated, validated and benchmarked. The calibration concentrated on matching the hydraulics of the SWMM model with the monitored data. The calibrated model was able to reproduce the monitored TSS reduction with an average error of 1.3% while the validation simulation runs were able to reproduce the monitored TSS reduction with an average error of 1.8%. The benchmark comparison to WinSLAMM combined both the calibration and validation events. The TSS reduction estimations had an average error of 1.6% for the SWMM + TSS model, while WinSLAMM had an average error of 2.8%. Although this difference in performance only slightly favours the SWMM + TSS model, a major benefit of this combination is that the flexibility of catchment design allows for site characteristics to be easily modeled in SWMM. Additionally, detailed simulation results provided by the SWMM + TSS model provide greater insight into the processes being modeled, as compared with the overall runoff and loading summaries available in WinSLAMM. Furthermore, WinSLAMM’s TSS removal model is based on empirical data, which may differ in different locations, while the physical removal modeled in SWMM + TSS accounts for the variations between sites and designs. While the TSS model that we developed produced TSS reduction values that were very close to the monitored data, there are a few areas where errors may be introduced into the results. One of the main issues we faced was with the underlying SWMM model. The SWMM model had a fairly high level of error for the parking lot runoff simulation. The parking lot produces the runoff which is treated by the bioretention cell; therefore, the variation between the simulated and the monitored flows changes how much runoff the bioretention cell has to retain in order to calibrate the outflow volumes. The SWMM model was not capable of simulating all of the features of the site, particularly the inlet structure and the overflow control. The Kortright Centre’s bioretention cell has a vertical standpipe with a perforated cap as its overflow structure; SWMM is unable to reproduce this site feature. While the tool was developed to perform well in Ontario, and did so for the Kortright Centre parking lot, it should be further tested on additional monitored bioretention cells to better validate it. Further testing should also be done upon a site which does not have such a high level of runoff reduction. The Kortright Centre parking lot only produced runoff for a very small number of events. While this allowed for a concentrated calibration, future testing should embrace performance over a large number of events. Because the flow at the Kortright Centre was monitored at the outlet structure, any monitored volume may have been a mix of both overflow and underdrain flows. The model will be better calibrated with data that is sampled separately at the underdrain and at the overflow structure. The tool in its current state uses the Yao et al. (1971) filtration equations that require the assumption of a steady state condition for the filter media. This assumption was shown to be adequate for event based simulations in the testing we performed. Future testing could explore long term continuous simulations and enhancements to the underlying filtration equations used in the TSS model to simulate the changes that would occur to the filter media as TSS particles are retained. Bosley, E. K., II. 2008. Hydrologic Evaluation of Low Impact Development Using Continuous, Spatially Distributed Model. Blacksburg, VA: Virginia Polytechnic Institute and State University. MS thesis. Brown, R. A. 2011. Evaluation of Bioretention Hydrology and Pollutant Removal in the Upper Coastal Plain of North Carolina with Development of Bioretention Cell Modeling Application in DRAINMOD. Raleigh, NC: North Carolina University. PhD dissertation. Center for Neighborhood Technology. 2013. Green Values Stormwater Toolbox. Chicago, IL: Center for Neighborhood Technology. http://www.greenvalues.cnt.org/. CHI Water. 2015. PCSWMM—Details. Guelph: CHI. http://www.chiwater.com/Software/PCSWMM/Details.asp. Clarifica Inc. 2003. Preliminary Assessment for Improved Design Criteria for Construction Sediment Control Ponds. Toronto: Toronto and Region Conservation Authority. Dussaillant, A. 2002. Stormwater Infiltration and Focused Groundwater Recharge in Rain Garden: Numerical Modeling and Field Experiment. Madison, WI: University of Wisconsin–Madison. PhD dissertation. Elliot, A. H. and S. A. Trowsdale. 2007. “A Review of Models for Low Impact Urban Stormwater Drainage.” Environmental Modeling and Software 22 (3): 394–405. MIKE URBAN. 2015. MIKE URBAN—Collection Systems. Hørsholm: MIKE Powered by DHI. http://www.mikepoweredbydhi.com/products/mike-urban/collection-systems. PV & Associates. 2013. WinSLAMM History. PV & Associates. http://www.winslamm.com/winslamm_history.html. Terraprobe Limited. 2008. Subsurface Investigation Report Pavement Investigation Kortright Conservation Area. Vaughan, Ontario: Terraprobe Limited.